FAQ: What water tank could fit under my deck? Question: Do you have under deck water tanks? I was hoping to store a supply of water under my front porch deck and was wondering if there was a tank that could help with this process. I would prefer something that was approved for drinking water. Answer: Thank you for contacting us! One of the easiest and most cost-effective solutions for under deck water storage is through the use of one of our Flexible Under Deck Water Tanks. Designed with a naturally low profile, these tanks can be built in any size from 25 to 210,000 gallons to safely store potable water. The sizing for your collapsible tank may vary depending on your available sizing options and hookup requirements. Typically the dimension customers look at first is the height. While a majority of our collapsible tanks are designed to have a low profile exterior, this may vary depending on the needed storage capacity. Depending on exactly how high your deck is, different heights may be required to meet your storage requirements. For under decks, customers typically lean towards smaller options such as 50 to 5,000 gallons. These tanks have a smaller height (usually up to 3 feet) and can fit in tight spaces. 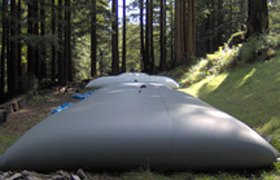 If you require a larger capacity, tanks may be adjusted or custom-built to meet your specific needs.